French Comic: Léonid. T. 1, Les Deux Albinos – review by Fred Patten. Léonid. T. 1, Les Deux Albinos, by Frédéric Brrémaud & Stefano Turconi. Toulon, France, Soleil, August 2015, hardcover €10,95 (48 pages). My thanks to Lex Nakashima, as usual for this French bande dessinée album. The locale is the farming district of Deux-Sèvres, in central-west France. “Léonid is a cat, not yet an adult, but not a kitten, either. Just a young cat. He lives in a house in the district, in the midst of trees, pretty far from any city and close to a farm.” Léonid is a young housecat, living with two other housecats (Hoa Mai, a Siamese, and Rosso, an elderly orange Pekinese) and a dog (Mirza, a toy terrier). His household is also the home of Atchi, a mouse constantly sneezing because he’s allergic to cat hairs. Léonid is allowed outside during the daytime to associate and play with the local feral cats; the female black-&-white Ba’on, and the males Bouboule (the fat one), Arsène (the nervous one), and an anonymous one (because he’s almost immediately killed). Two newborn lambs are slaughtered at night, apparently by a wild animal. The cats inside a house are presumably safe, but the feral cats who spend nights outdoors worry that a fox may have moved into the neighborhood – or (for those who fear the less-probable predators) a wolf or an ermine. Léonid finds out that it was two bloodthirsty albino cats, but at first he can’t convince anyone else. They think that he’s exaggerating to make himself look important; then, when the two albinos kidnap Ba’on, they say that it’s every cat for himself. Meanwhile, the farmer has set Zeus and Apollon, his two killer hounds, loose to safeguard the rest of his flock, and the dogs run bloodily through the neighborhood as a savage danger to all of the cats who aren’t safe in houses. The Two Albinos is mostly the story of how Ba’on is kidnapped by the two albinos to be their slave, and how Léonid and Atchi, the sneezing mouse, venture outside to her rescue. They’re successful, but not really because Ba’on reveals that while she was in the albino cats’ power, they boasted that they are just the vanguard of “the horde”, “the avant-garde of the terror of Great Attila, our guide” who will kill or enslave all the animals of the district. Léonid, Ba’on, Aichi, Hoa Mai, Rossi, and Mirza are left wondering what to do when Attila and his horde arrive? There is some humor, mostly provided by Aichi the mouse, but in general The Two Albinos is a clever light talking-animal thriller. 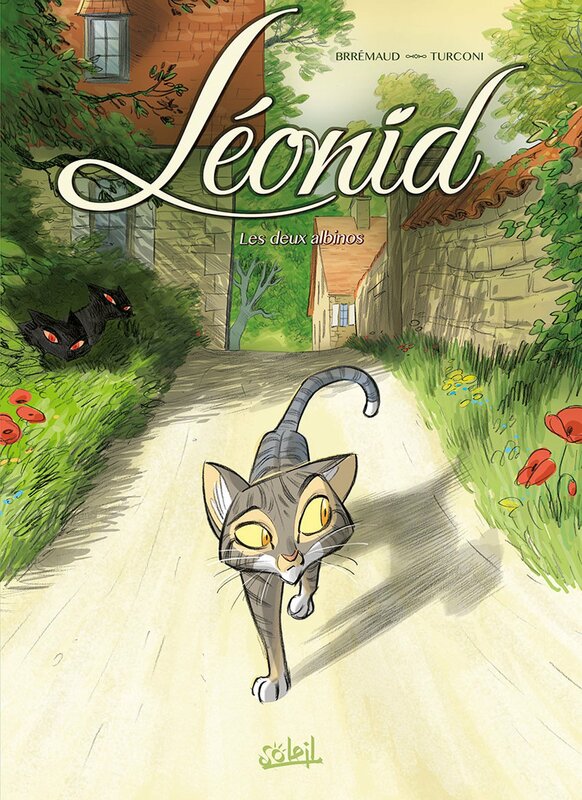 Those who enjoy fantasies featuring the world of sentient pets will be glad to be introduced to the Léonid series. 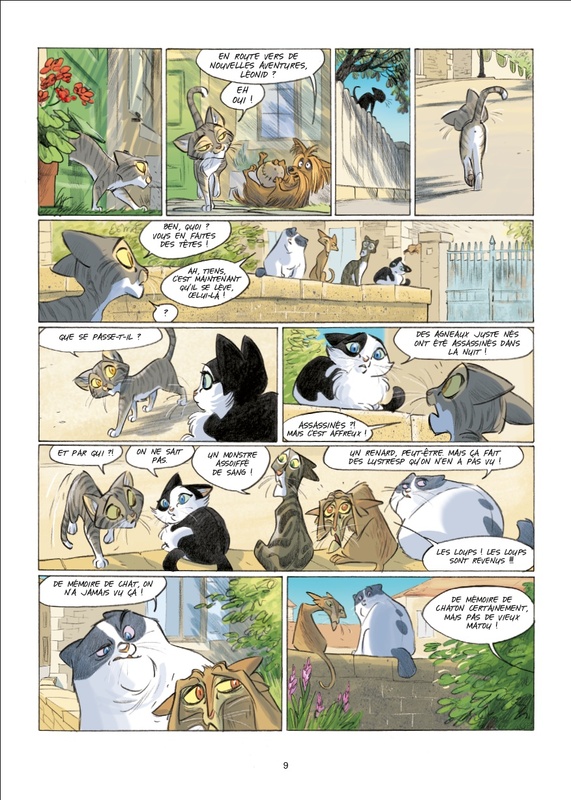 Frédéric Brrémaud is the artist of those wordless “Love” albums that several furry fans get from Stuart Ng’s art bookshop. I never knew Felidae was a “furry convention favourite”. Also, I still refuse to read the book. I don’t care if it “has more details”. The Felidae novel by Akif Pirinçci is a quite good murder mystery with cats, but is not for the squeamish. I may be out of date saying that the Felidae German animated feature is a furry convention favorite, but for more than five years after it was released (in 1995? ), you could hardly find a furry convention that didn’t have it on its film program, at least on the West Coast. Of course, there was only ConFurence, Further Confusion, and ConiFur Northwest at the time.